St. Augustine, Florida is full of history. In fact, it is the longest inhabited European-founded city in the United States. It’s hard to avoid history on the sunny, narrow streets throughout St. Augustine. Places to stay are tucked throughout the city among the abundant Native, African, Greek, English, Spanish and Minorcan influences. There is so much to learn about this confluence of new and old while on your St. Augustine vacation, here are 5 educational experiences worth checking into during your visit. 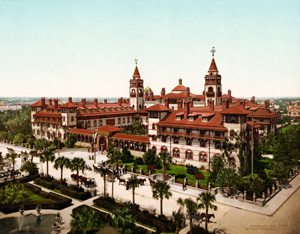 Lightner Museum: Formerly Hotel Alcazar, the Lightner Museum was built in 1887 and designed by the same architects who later went on to design the New York Public Library and the U.S. Senate office building. Its three floors hold exhibits from America’s Gilded Age and relics of daily life in the 19th century. The collection also includes stuffed birds, a small Egyptian mummy, model steam engines and a music room. Old Town Trolley Tours: For over 30 years, this tour company has provided St. Augustine with sightseeing tours throughout the city. Narrated as you go, there is a mix of fact and trivia, as well as fun stories as the trolley winds its way through the nation’s oldest city. Among several tours available, including sightseeing and ghost tours, a perk is being able to hop on and off the bus to explore on your own time. Castillo de San Marcos: Tour the grounds of the oldest masonry fort in the continental United States that dates back to 1672. The fort has seen its share of sieges and use including as a prison for Native Americans and later for Confederate soldiers. Visitors can tour the bastion and watch cannon firings along with historical re-enactments throughout the year. Crisp-Ellert Art Museum: Venture over to Hogwarts Flagler College to experience the school’s Art Museum which offers an opportunity to view contemporary art in rotating art exhibitions. The exhibits feature artists from the area as well as international artists and hosts various programs like artist talks, readings, a film series and panel discussions. Ponce de Leon’s Fountain of Youth Archaeological Park: This location is the actual site of the first settlement area in the nation’s oldest city. The park offers both indoor and outdoor activities and exhibits to explore. From living history interpreters in a replica of Seloy, a Timucua Village that existed for a 1,000 years, to Spanish cannon demonstrations and a river walk that extends into a salt marsh. This is a place to spend the day with your whole family.